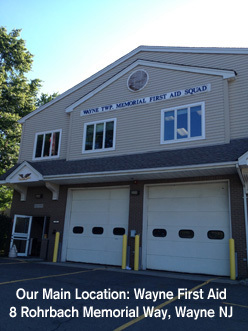 Our Main Location: Unless otherwise noted on your course registration, ALL classes will be held at the Wayne Township Memorial First Aid Squad Building, 8 Rohrbach Memorial Way (corner of Taylor Drive and PAL Drive, class on 2nd Floor, See Google map), Wayne NJ 07470. If you need to contact us use our website for faster service. To call our office, please call 973-694-2893. If you are picking up books and/or materals please call us to make an appointment to meet up with you. If you have any question or problems, you can contact our President David Spera at 973-694-2893 or use the contact us page to send us a message.